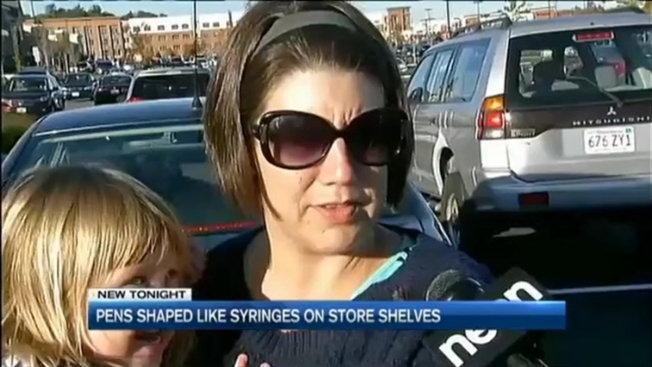 Target is selling toy syringe pens in the seasonal section near the Halloween costumes, toys and candy, and one local mom says they're just too realistic. Susan Haight, a mother of two and a teacher in the North Hampton, New Hampshire, school district, now wants those pens off store shelves, and she's brought her case directly to Target. "It just kind of seemed incredibly irresponsible to me," she said. Haight also says the recent heroin epidemic is very concerning and alarming to her, both as a parent and as a teacher. "We have needles that are turning up in playgrounds," she said, "Even if it's not about heroin syringes and needles, it just doesn't seem like they should be toys." Haight is also concerned a child who stumbled upon a real syringe at a playground, park or beach may not know the difference and get hurt. She said she doesn't like how the pens are being marketed as Halloween products, as strangers can give them to children. "Parents don't even have the ability to choose if their kids are getting them or not," Haight said. Haight says she wasn't satisfied with the response when she went to the customer service desk at the Greenland store. She says she was on hold for more than 20 minutes when she called the 800 number, so she says she eventually emailed the corporate office. "I got an email response that was sort of a canned 'I'm sorry if we've offended you, Thank you for shopping at Target,'" she said. "At Target, our intent is never to offend any of our guests, and we appreciate their feedback related to this product," Target said in a statement to necn. "We have shared this feedback with the merchants for them to consider as they plan for future assortment." Haight is still hopeful they'll pull the pens off shelves.